Deception? Trickery? Mockery? Division? Betrayal? Takeover? Rigged: Electoral lists are not updated! Doctored electoral districts! Youth under 21 can’t vote, 2,500,000 (foreign) workers can’t vote! Fascist: Progressive organizations have been dissolved! The Government has freed the OAS terrorists! The State spreads repression in the factories and in the streets through its police and CDR commandos! Poisoned: The ORTF is besieged by the army! (Radio) Europe and Luxembourg are owned by the bourgeoisie! The mass media are on capital’s payroll! THESE ELECTIONS ARE A MANEUVRE TO DIVERT AND SABOTAGE THE REAL DEMOCRACY THAT WAS BORN IN MAY. 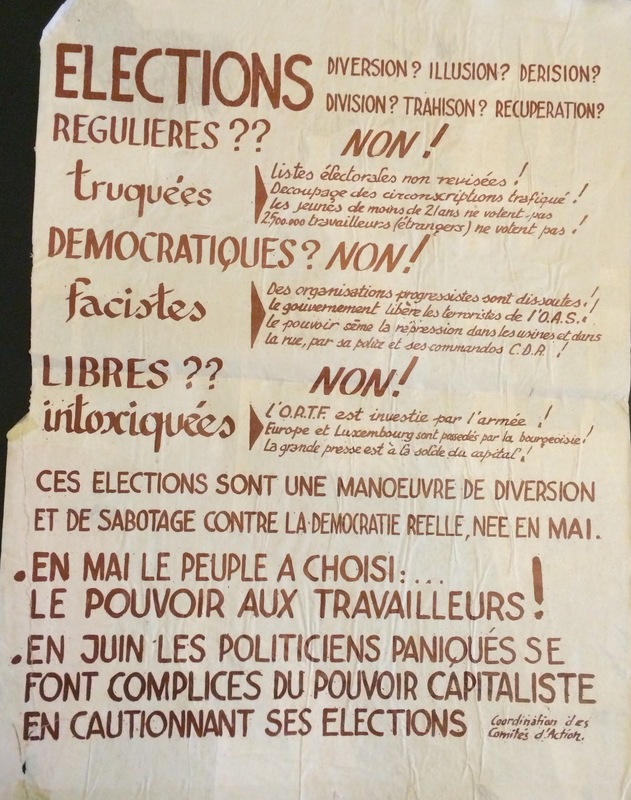 – IN MAY THE PEOPLE CHOSE: … WORKERS POWER!